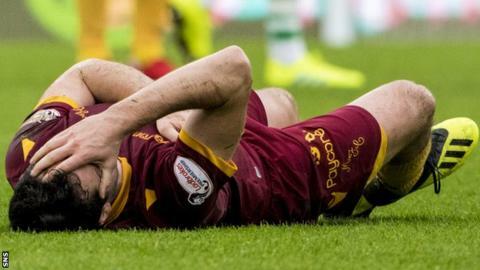 Motherwell manager Stephen Robinson admits he has concerns over how midfielder Carl McHugh will recover from his latest head injury. The Irishman, 26, became unconscious after colliding with Celtic's Odsonne Edouard on Sunday and was released from hospital later that day. It was the latest in a series of similar incidents involving McHugh. "For the fourth time this season he's been knocked out. It was scary scenes," Robinson told BBC Scotland. "It was a real, real concern for us. He's got a massive bang on his head, so obviously he won't play for a couple of weeks and that's the real thing I'm worried about. Hopefully, Carl will be okay and psychological damage that does for you, for the fourth time - that's my major concern. "He's okay. He doesn't feel physically sick or anything at the minute so that's good." McHugh had come on as a first-half substitute after team-mate Tom Aldred had sustained a head injury and was taken off on a stretcher with 12 minutes to play. "After the game he was scared and I don't blame him," Robinson explained before Wednesday's meeting with Kilmarnock at Rugby Park. "He was completely knocked out. He couldn't move, he was in a neck brace for four hours after the game, which is obviously precautionary. [Physio] Davie Henderson and the medical staff at Celtic were fantastic with us. "Carl plays with aggression, he's really, really good in the air, that's his forte. He's a defender that plays in midfield at times so he's been really unlucky and unfortunate. "Before I came to the club he had a real problem with it psychologically recovering from that. It's a little bit scary when you think about it. "This is the serious bit of football, where somebody was in a neck brace and could have potentially been paralysed the way he landed. So thank goodness it's not that serious and it's just a case of following the concussion protocol."